PHOOEY on the Tea Party - We Need A MARTINI PARTY! Tired of hearing about the Tea Party? Stressed out over filling out your tax forms? Afraid you'll never make it to Happy Hour today? Let Uncle Sam buy the house a round! 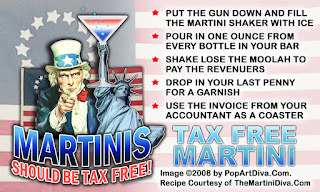 Americans for a Tax Free Happy Hour!